So I've recently fallen in love with John Zorn's current Masada book, The Book Of Angels. So far there is 11 volumes of amazing jazz and klezmer tunes that are sort of traditional to the the Jewish culture as he sees fit, and each volume is a different artist (or part of the "Masada Family") and takes some of the tunes and makes a record however they want. All the records sound vastly different, yet they are all relatively short Zorn tunes. For those scared of John Zorn much of the work is his easiest to get into. It is not easy listening but it's definitely not demanding. Sort of the ideal blend. Jamie Saft rips it on the keyboards, Greg Cohen holds his own on the bass and then Ben Perowsky pounds the drums like his is known for (let us not forget he released "Camp Songs" one of my favorite Tzadik releases). This is the first version which has a nice nice jazz element, and kind of goes from some nice cool jazz to free jazz track after track, all while maintaining a certain Jewish feel. I'll probably upload all the volumes as I like all of them. Great stuff. With Sanhedrin: Unreleased Studio Recordings 1994-1997, saxophonist/composer John Zorn put a period on what turns out to be but the first phase of his Masada project. His voluminous Masada songbook, first emerging in â€™94 with his quartet featuring trumpeter Dave Douglas, bassist Greg Cohen, and drummer Joey Baron, has gone on to a wide variety of interpretations, including solo guitar, piano/violin recital, string trio, and electric octet. But when Zorn indicated in the liner notes to Sanhedrin that he had composed an entire second book of Masada music in an almost ridiculously short period of time, the question arose as to whether there was something new to be said, after over two hundred compositions in the first Masada songbook so vividly and completely explored the juncture of traditional Jewish music and a variety of improvising contexts. Based on the first recording of Masada Book Two material, Astaroth, Book of Angels, it's clear that Zorn's frenetic imagination has yet to run dry. In fact, there are a number of surprises about Astaroth that create high anticipation for future Book Two releases. First is that, while Zorn continues to mine the harmonic territory of Jewish music, the overall aesthetic seems less direct, with the pieces now subsumed as part of a greater musical whole that recognizes broader thematic and rhythmic concerns. While some might accuse Masada Book One of ultimately becoming predictable, including hypnotic rhythmic foundations for some pieces, and rapid-fire themes for others, breaking down into chaos only to be magically pulled back at their conclusion, the material on Astaroth feels less categoric. And while nobody could accuse the Book One recordings of being anything but open-ended in terms of improvisational potential, the Book Two material feels somehow less rigidly of a kind. 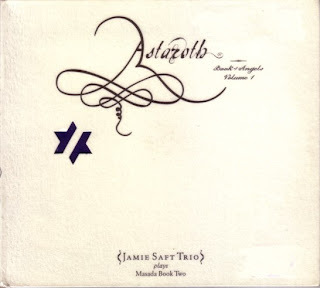 But perhaps the biggest surprise is Jamie Saft—a keyboard player who has always seemed more a jack-of-all-trades, but here demonstrates an heretofore unheard talent in context of a traditional piano trio format (also featuring Greg Cohen and drummer Ben Perowsky). In the past, Saft's contributions have tended to feel more like confection, textural icing on the cake. Here he demonstrates an unfettered imagination and sense of invention that, for perhaps the first time, truly dominate. Capable of lyrical economy on the relaxed vibe of Shalmiel� and the melancholically bluesy Lelahel; harder-edged expressionism on Ygal�; flat-out swing on Ezeqeel and Sturiel; naive innocence on Ariel�; and darker abstract impressionism on Baal-Peor, Saft's performance on Astaroth deserves to see him reach a larger audience. Cohen and Perowsky are equally impressive, but that comes as less of a surprise. And with Cohen having been a member of the flagship Masada quartet from the mid-90s, there's an undeniable continuity between earlier efforts and this new phase in Zorn's investigation of the varied possibilities of traditional Jewish music. If Astaroth is any indication, Zorn's Masada projects will continue to retain a specific identity, while branching out into even broader areas of exploration.